Dog bites suffered by young children are often inflicted by the family dog. Such incidents frequently occur despite the presence of an adult. Even benign behaviours on the part of children, such as hugging the dog, can trigger an aggressive response from the animal. 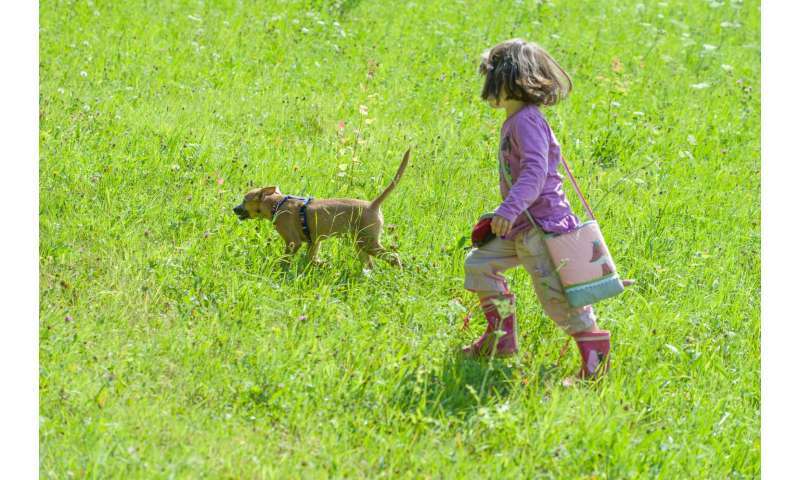 A survey of dog owners conducted by researchers from the Institute of Animal Husbandry and Animal Welfare at Vetmeduni Vienna shows that people underestimate risky situations involving the family dog. A better understanding of the dog's needs and simple measures such as child-free resting and feeding places for the dogs can significantly reduce the risk of dog bites. The analysis of the survey was published in the Journal of Veterinary Behavior. Larger dogs are always safer than small dogs, if the dog has been raised properly. The dog should get used to the child playing with its food. Make sure the dog notices the child adding extra food to the dish. Plus having the child feed the dog it's meals is a BIG plus. If your dog ever even looks at a child in a threatening or suspicious manner, attack the dog by rolling it on its back while yelling at it. Now don't get mad at the dog but make the dog think you are vary mad.